There are few things more magical than the idea of whisking back to the past and living out a dream of a medieval fantasy. About the only thing that can compare is bringing your kiddo along for the ride. Just imagine the tale that you both will craft. Picture the young lass: a noble princess whose words can tame the ferocious dragon; a crafty maiden who can turn an outlaw into a hero; or perhaps the faerie queen who is ready to brandish bow and blade, herself! Fortunately, with all the fun of old world acts, you still won't have to worry too much about being in style. 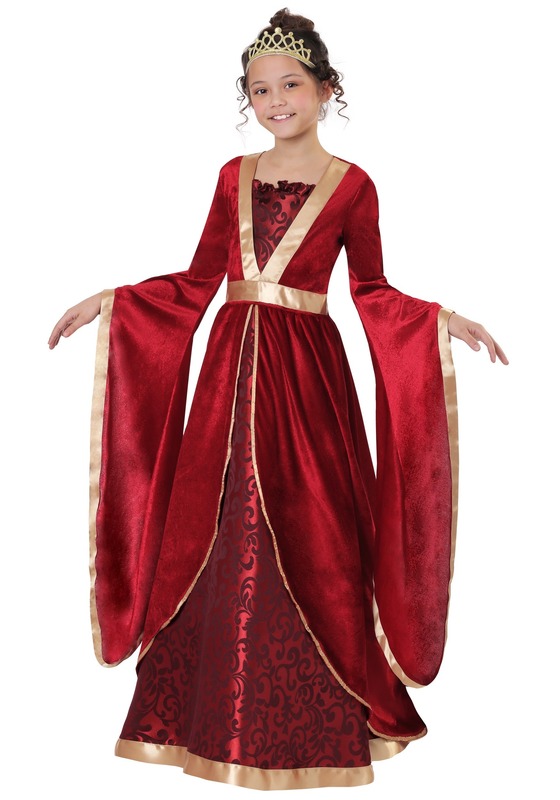 Our team of designers practically live at the Renaissance Festival and have this exclusive Maiden Costume that will have your kid feeling like a true to life fairy princess. This maroon dress is full-length and features a velvet overdress with brocade inset, oversized sleeves and golden trim at an empire waist. The golden crown brings this from a lovely look to an exquisite medieval marvel or royal Renaissance wear!